Kait and Zach's wedding at the Four Seasons was hands-down one of our favorites to date! We got to set up the photo booth a bit early for their reception, which allowed us to see their reception decorations before all the fun began. The entire day was full of special details that we were totally obsessed with, like the custom dance floor monogram, their pedicab send-off and of course we loved how their print template perfectly matched their wedding invitations! Plus, working with vendors like Pearl Events, The Inviting Pear and Texas Pro DJ is always a treat! It was so obviously how loved this couple was just by listening to the speeches that were made following dinner. Kait's dad explained that she was a swimmer when she was young, and when they stayed at the Four Seasons when they came to town for a big swim meet, 11-year-old Kait turned to her dad and said "I'm going to get married here." Fast forward and here she is, marrying the love of her life in one of the prettiest venues in Texas and we still can't believe we got to be a part of it! 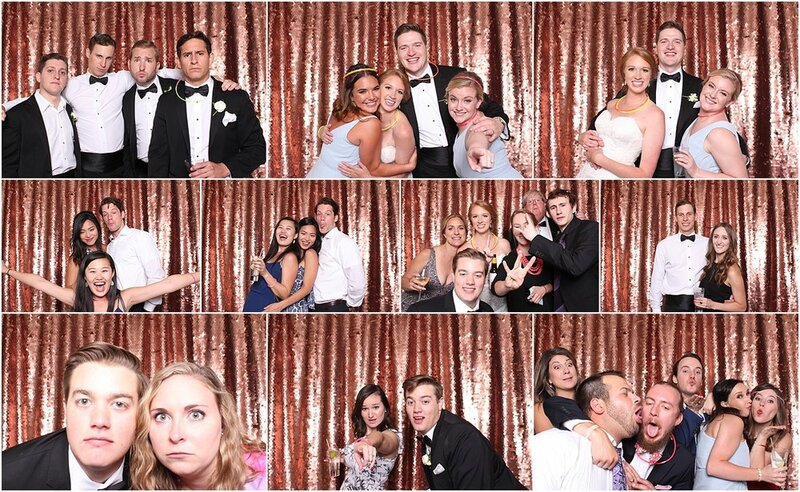 Looking for a photo booth rental for your upcoming wedding or holiday party, or want to really make a statement for your company at a local festival or large event? Contact us today!